The first Jeep – the Willys MB – was produced for military purposes in 1941. After the war, Jeeps entered the civilian world. They became the first sport utility vehicles (SUV) in the civilian automotive market. And you were wondering why they’ve became so popular. Well, now you know. The younger brothers and sisters of your Jeep revolutionized the automotive line. After the inception of the Jeep, people could own something different than a car or truck – they could own an SUV. Today, SUVs are prevalent in California and around the world. The Jeep will continue to be the first original SUV, so take pride knowing that you own a vehicle that helped shape the modern automotive world. Jeeps are reliable and tough vehicles produced by the Chrysler corporation, but they do have their occasional problems. Whenever you experience something unordinary with your Jeep, rely on the experienced team at Villa Automotive for your Jeep needs. 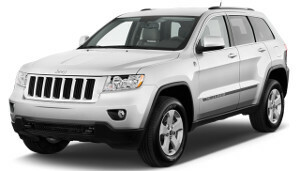 We specialize in Jeep repair in San Luis Obispo. We also do preventative maintenance like oil changes, smog checks and system flushes. Jeep owners rely on us for all of their Jeep needs. They have experienced our dedication to customer satisfaction and flawless Jeep repairs. We look forward to you joining our family of auto-repair professionals and satisfied Jeep customers.